Sometimes it is sad, sometimes it is happy. This one was a little warm for me personally but it was filled with such abundance and fortune – at least in my mind. Nothing ‘huge’ happened, a little 21 person family fun, a quick trip to the lake house and a lot of ‘fresh’ ideas for some artwork. Now, we get down to business – more art. So I am experimenting with some ideas, based on my last post – from JUNE (holy cow). Good ideas take time. you just color or would you prefer to add them yourself? (You would be provided with some tiny bit of guidance and some samples 🙂 ). Thanks Erika – that’s a great point ! The summer in Finland was rainy and cold, so I still miss warmth! Luckily there are bright and shiny colors in your Hipster! Love your hipster and wonderful colors and style! I think I would prefer a mix of options for a coloring book. Many people who buy them are looking to just get in some good zen time and fill in the colors. Yet, there are some that would like the freedom to do their own designs. So, maybe you could offer both in a book. It would allow for people to see examples of what can be done. 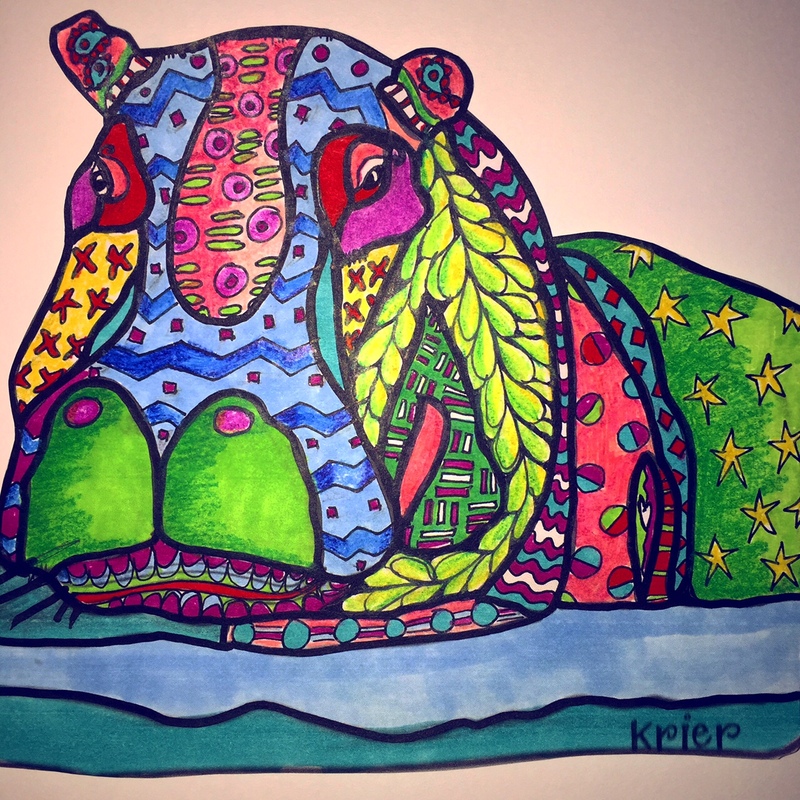 I have a place in my heart for hippos and I love yours! thank you Marji ! I really appreciate the input 🙂 Choice is always a good thing. Love your hipster…gorgeous and full of whimsy! My daughter just purchased 5 new adult colouring books and I noticed there were lots of details! So I’d say put the doodles in. Thanks Giggles ! I see how the trend is spreading very, very quickly ! I think a mix of some pages with doodles added and some without would be a perfect solution. Then you are covered depending on whatever mood you are in! The Hippo is simply wonderful. All the fabulous colors. I have some “Adult Coloring Books” They are the best thing for me. I color at night to settle my brain and relax. I think what ever you put out for a coloring book would do very well right not. Good luck. I love all the colors. These coloring books for Adults are just wonderful–your ideas are lovely.